The legislative election is just a few days away now. Aside from all of the campaign posters around town, I haven’t noticed any significant changes here. My local mall is opening two hours later on the day of the election this Thursday. The presidential election will be held on the 8th of July. An anti-Megawati campaign on Facebook has been launched and the made the front page of some newspapers here. The Say “NO!! 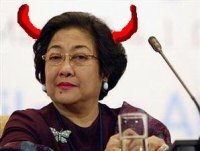 !” to Megawati currently has over 78,000 supporters. – Former Jakarta governor Sutiyoso. – Former Military of Indonesia commander Wiranto. Copyright © 2009 About Indonesia. Powered by WordPress and A Dream to Host theme by Art of Blog.